A few weeks ago there was a women's expo in my town - basically a place where you go to spend two hours being advertised to. Surprisingly, it was kind of fun! There were goodie bags at the door for $20 and I got one; it included a bottle of nail polish, the brand being Constance Carroll. That brand isn't readily available here in New Zealand, so I was keen to give it a try! And I loved the colour, it's called Pastel Orange. Pretty accurate description, I guess, they're clearly more literal when they name polishes than OPI! This is the design I created with it. I also used China Glaze Lemon Fizz for the index and pinky, and Contemporary White and Black Mark by Jordana Pop Art for the details. 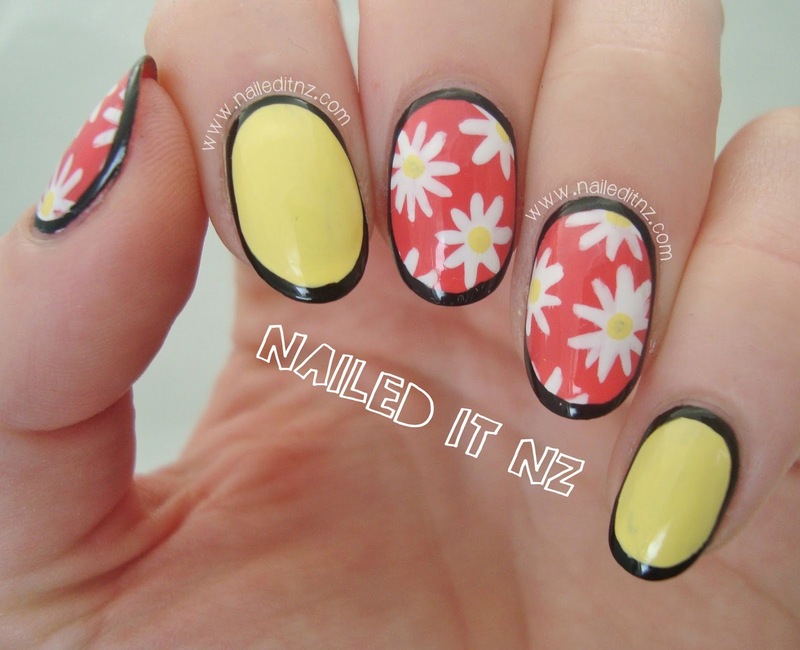 I actually just uploaded a tutorial on YouTube on how to do daisy nails, so if you want to watch that you can find it here! I wasn't 100% confident about the black border, but I had reasons for choosing it - even though it looks a bit harsh. I needed a colour that was opaque enough to cover the design underneath, and preferably a pop art polish (the ones with the thin brush in the bottle). Saves clean up later! Considering this was a "playing around on Sunday afternoon" design rather than anything terribly important I just went with the black - simple! These are cute! The border adds something different too.